At a recent TTC Board meeting, the question arose of just how well Queens Quay operated as a transit street and how long it took the streetcars to navigate through the new setup. Staff claimed that they had added six minutes to the schedule to compensate for problems, but this really didn’t give the full picture. Not to miss a chance to carp, Councillor Minnan-Wong latched onto this number and worked it into the debate at Council when the “Waterfront Reset” report was up for debate. The report passed without amendment, but the seeds of disinformation have been planted. In the interest of clarity and accuracy, rare commodities at City Hall, here is a review of what has actually been happening. Up to May 2012: the scheduled running times are consistent with only slight variations, usually a minute here or there to make the headway come out to an even value. May to July 2012: Because of continued deterioration of the track, there was a slow order from Bay to Spadina for which additional time was provided in the schedule. July 2012 to October 2014: Route under construction. Streetcars replaced with buses. October 2014: Streetcars return on the original schedules, but due to problems with traffic signals and some continuing construction interference, additional time was allocated starting in January 2015. July 2015: Extra time for Pan Am Games. January 2016: Service cut back to Fleet Loop fo construction at Exhibition Loop. The running time was further reduced in March. July-August 2016: Service restored to Exhibition Loop. From this history, we can see that the scheduled round trip for Union to Exhibition and return was set at about six minutes above the pre-construction values. Note that this is for a round trip, and so the difference is three minutes each way. This was erroneously quoted by some as the change in the one-way trip time from Bay to Spadina. Next comes the question of the actual length of trips over portions of the route. For this we turn to the TTC’s vehicle tracking data. These charts take a bit of explanation, and for convenience I have included one page below. Route “519” is a dummy route number in which I have consolidated data from both 509 Harbourfront and 510 Spadina trips. The latter are meaningful only for the portion of the route east of Spadina. No, the TTC is not proposing a new route. GPS problems limit the amount of valid data from cars in the tunnel to Union Loop. Service from January 2016 onward ended at Fleet Loop. The section of the route that was rebuilt lies between Bay and Bathurst. Data are presented from two pre-construction periods in the winter (February 2010) and early summer (June 2011) to show seasonal differences if any. Data from May 2015 onwards give the status from “more or less complete” through to early fall of 2015. Data from December 2015 and January 2016 show winter conditions, as well as before/after values for the cut back to Fleet Loop. Data from May and June 2016 show current conditions. Each page presents averages of weekday running times (as well as standard deviations of these values) broken down by half-hourly intervals. The full set of charts covers the day from 6:00 am to midnight. Spikes in the values are (with a few exceptions noted below) caused by delays that pull up the average and increase the scatter in the values (hence a larger SD). 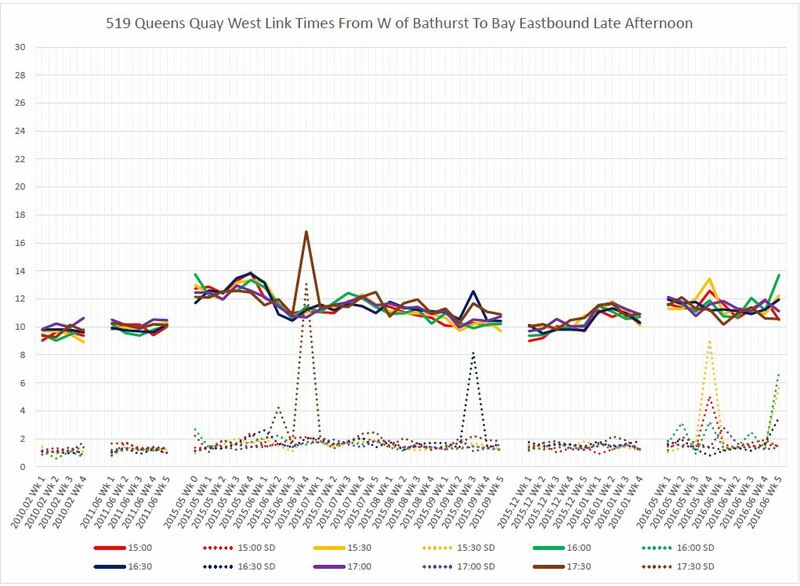 The history of westbound running times shows the severe effect of the original signal implementation on Queens Quay operations. Even at 6:00 am when there is absolutely no traffic conflict, the running times jumped by up to four minutes in May 2015 compared with June 2011. The numbers improved by July with the implementation of the final version of the traffic signal controllers and software, but running times have never returned to the pre-construction level. Values for midday and afternoon show a similar pattern, but the pre/post difference is smaller. Eastbound times show a similar pattern, although one anomaly requires explanation. During 2015, Harbourfront cars were stored at Exhibition Loop, and in some cases would leave early (possibly to get out of the way of cars on other routes also stored there). These cars would take a layover once they were clear of Fleet Street, and so their eastbound trips to Union are unusually long. This only shows up for trips starting before 6:30 am. Through the day, travel times both ways are about two minutes greater today than they were in 2010/11 for an overall increase of four minutes in the required schedule time. These charts give a view over the central portion of the route, but a look at smaller segments shows that the change is confined to certain parts of the route. Westbound times from Bay to York are quite short, and slightly improved from pre-construction by the elimination of the traffic signal controlling movements to a former parking lot on the north side of Queens Quay. Eastbound times show an improvement of almost one minute thanks to the elimination of the eastbound stop and traffic signal. This section of the route saw many changes both in stop layout and traffic signalling. Westbound trips went up by about two minutes (half of the total increase from Bay to Bathurst) in this section immediately post-construction, although much of this has been clawed back through improvements in signal timing. Eastbound trips showed a much larger jump in travel times post-construction, although as with westbound, the difference today is much smaller than in May 2015. The signalling at Queens Quay Loop has been changed substantially to manage streetcars, autos, cyclists and pedestrians through the area. Travel times from east of Queens Quay Loop (the first signal encountered westbound) to west of Spadina (the first signal encountered eastbound) have gone up by about a third, or 30 seconds, over pre-construction values. The effect was worse immediately after the line re-opened because the intersection was running on a fixed cycle with no ability to recognize and adjust for the presence of streetcars. The section from Spadina to Bathurst contains no fewer than three traffic signals, any of which can interfere with transit service. One is the “crossover” where the eastbound auto lanes move to the north side of the streetcar right-of-way, one is at Dan Leckie Blvd., and one is at Bathurst itself. The crossover signal did not exist, of course, before the reconstruction of Queens Quay. Westbound running times were about two minutes higher after reconstruction, and the problem has only worsened since then notably in late 2015 during some periods. This implies a change to the operation of at least one traffic signal. The situation is similar eastbound, although the change in late 2015 is not as pronounced. Over this section of the route, there has been a gain of 1-2 minutes running time compared with pre-construction. At this intersection, the signals must sort out traffic on Bathurst Street, Fleet Street, Lake Shore Boulevard and the three legs of the streetcar network. This is not a location affected by the reconstruction, and one would expect to see similar times from the point on Bathurst south of the intersection to a point on Fleet west of the intersection. Westbound, this is the case – travel times are the same pre- and post-construction. However, eastbound times are about half a minute longer indicating that something in the operation of the traffic signals has changed. One page for each hour beginning at 6:00 am and running through to midnight. On each page, the average speed of vehicles along the route is plotted for the first two weeks of June 2011 (blue) and of May 2016 (orange). The orange line (current data) is consistently below the blue line, although the degree to which this occurs varies by time and location. Changes in the stop locations can be seen where dips in speed have shifted from 2011 to 2016. New sources of delay show up as a dip in 2016 with no corresponding dip in 2011 (for example, eastbound at the “crossover” between Dan Leckie and Spadina). The charts show clearly that service overall is slower in 2016, but the degree to which this is true varies quite a bit along the route. Locations where efforts should be made to improve operations, notably at signals, are self-evident. Although the TTC speaks of the added running time as being on the best-known section of Queens Quay from Bay to Spadina, in fact the lion’s share of the extra running time is contributed on the west end from the entrance of Queens Quay Loop to Bathurst/Fleet. Problems with signals in the central portion east of Spadina have been fixed at least to the point where running times are roughly the same as before reconstruction. It is difficult to say how much extra is contributed by the TTC’s preference that streetcars drive slowly here, and the interference by cycling and pedestrian traffic is affected by seasons, day of the week, time of day and weather. Interference by motorists tends to show up more as spikes in travel time caused by an errant vehicle whereas slower operation to avoid pedestrians and cyclists shows up as a general reduction in speed. 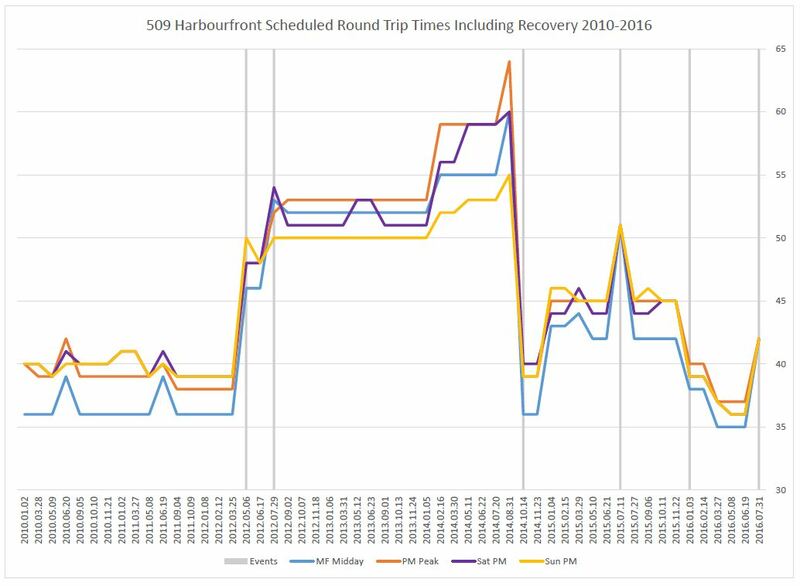 The TTC plans to revise the schedules on 509 Harbourfront once the route is operating fully with new cars, and I will update this review once that changeover is completed. Information on the process by which TTC vehicle tracking data are converted for the charts above is available in Methodology For Analysis of TTC’s Vehicle Tracking Data. This entry was posted in Service Cost and Quality, Transit, Urban Affairs, Waterfront. Bookmark the permalink. Does it plan to revise them with more or less running time? Steve: They have not said, but I expect downward. The question is by how much. Long before Queens Quay was completed, I predicted traffic of all kinds here would be a tad slower – transit, bikes, cars, pedestrians. That’s the nature of these types of pedestrian-oriented boulevards, as seen in many European cities. Three minutes added to the Union-to-Exhibition route is not overwhelming. At least there is something beautiful to look at. I used to get everywhere downtown on transit in half an hour. Now it takes an hour. I don’t understand how suburbanites think we are so blessed with transit in the city core. They could improve things somewhat if the crossing light button was south of the bike lane, rather than between the bike lane and the streetcar lanes. As people waiting for the light naturally wait at that location. That cross-over signal does not seem to be well-managed. With nearly 200m from the eastbound stop at Dan Leckie Way to the cross-over (well over 20s at a max 12m/s running speed) the eastbound streetcar should simply _never_ hit that light red, and yet I’ve seen streetcars have to slow to a stop, or nearly, on several occasions. Westbound is harder, but my impression there is also that streetcars have to stop more often than they should; dwell time can be unpredictable but can estimated within reasonable bounds for the majority of cases. Steve: There is a common problem in the “transit priority” design that each location operates independently of those adjacent, and the advance detection only occurs within the “block” ahead of the signal. For Dan Leckie eastbound, this means that the trigger for the crossover does not occur until a car leaves the eastbound stop rather than being based on a reasonable estimate of stop dwell time plus travel time. The shorter the advance detection, the more likely it will be that the streetcar is held because the traffic signal cannot cycle quickly enough. “Transit priority” is unfortunately under the “control” of the city’s transportation department (roads). While in the 1950’s they were the people that introduced the “pedestrian crosswalks” to the city, they have been very reluctant to experiment or improve. It took them years to introduce “zebra crossings”. When they introduced the “pedestrian scramble” crossing, they seemed to ignore how they did it in other parts of the world. Elsewhere, they would stop the pedestrians and let motor vehicles move, even allowing right turns without negotiating with pedestrians. The only time pedestrians can cross is during the scramble. Not here. Here, pedestrians still cross with the traffic, but have a scramble in additon. In Toronto, we have the traffic lights operating even if there is no motor vehicles nor pedestrians. Transit vehicles have to give way to left turning vehicles, even if there aren’t any vehicles turning. We need a transportation czar who is transit oriented first and foremost. Preferably, not from the automobile-oriented suburbs. Steve: The traffic controllers and software are to be updated across the city in a project now underway, with more sophisticated software and options for managing various conditions. I am waiting to see just what this will bring to “transit priority” and other issues you mention. A related issue is whether there is a truly dynamic program running at an intersection, or simply one that cycles through all of the options. For example, left turns across the transit lanes should only be activated if something is waiting in the queue. However, there can be situations where (a) an initial implementation such as on Queens Quay when it first opened gives a left turn whether it is needed or not, or (b) the detector in the turn queue is always indicating a vehicle is present, or more likely (c) a detector has failed, and the signal has been programmed to always give a turn indication while we await repairs (which can take some time, or be forgotten). Similarly, some locations always give a pedestrian phase whether it is requested or not, while others only show the walk signal if requested. There is some debate on whether it is better to always give a signal because it will be expected or the area is always busy enough to warrant it, as opposed to training pedestrians that they must push the button to get a walk signal. If signals don’t behave “as expected” for too long, pedestrians tend to cross through breaks in traffic. Since the line has re-opened, the signal at the intersection of QQ and Dan Leckie Way has operated on a fixed cycle. It is rare that I’m able to pass through that intersection (in a streetcar) without stopping. For a while in the spring and early summer of this year the lights were not holding for streetcars from Bay to Spadina after they were working in 2015. Thankfully this has been rectified and are now working again. There are pedestrian signals in the world where pedestrians do not have to press any button. Just their presence will activate it (like cars) and would shorten or lengthen the crossing time to actually how long they take to cross. A jogger will shorten the time. An elderly person with a walker will lengthen the time. They have been around for over four years now, but I guess Toronto is still “studying” them… if they even know about them. The Calgary CTrain runs along 7 Avenue in downtown Calgary and looks like surface subway (long trains, high-platform stations) running along a city street. The street is reserved for buses and trains only, but there are many cross-streets controlled by traffic lights. What I noticed is that the trains run faster on 7 Avenue and have fewer stops for cross traffic than streetcars on a PROW in Toronto. Fortunately for the CTrain there is no priority for left-turn vehicles along 7 Avenue as there is no private vehicle traffic along that street. I felt envious of Calgary. Elsewhere, they would stop the pedestrians and let motor vehicles move, even allowing right turns without negotiating with pedestrians. The only time pedestrians can cross is during the scramble. Not here. Here, pedestrians still cross with the traffic, but have a scramble in addition. While this is generally true elsewhere, it should be noted that the intersection of Dundas and Yonge allows no turns at all for both roads, so having regular pedestrian crossings during traffic green phases works fine. Even if traffic services didn’t look beyond their own intersections, they still suffered from the tunnel vision of “it works for that situation, so it must work for all situations” syndrome. Bloor and Yonge allow right turns except at peak times weekdays and Saturdays (and never on a red light), so the pedestrian with traffic signal should only be enabled during those times. As for Bay and Bloor, from the moment it was installed I said it was doomed to fail because of this very reason as right turns almost always permitted (they are banned on red lights in all directions and only northbound Bay traffic cannot make them weekdays from 7am to 7pm). There is no one-size-fits-all solution for how pedestrian signals should work, but many outside the core should work this way outside of peak hours: enable the pedestrian signal from the start of the green phase, but limit it to 10-15 seconds before a countdown starts. Once the countdown completes, the pedestrian signal should display the hand. Anytime a pedestrian arrives and presses the button when their direction requested remains green for traffic, they would immediately get a permissible signal that would repeat the start-of-green procedure. The trouble with many less busy intersections is that either the pedestrian signal remains on for the entire green cycle, or a countdown occurs but the pedestrian signal returns to ‘go’ when it reaches zero. Any vehicle arriving or pedestrian pressing the button on the cross street will have to wait for the entire countdown (usually 20-32 seconds) before the signals start their change. I shudder to think how many tons of greenhouse gasses are produced annually by this extra waiting time (not to mention the situations where lights change with no traffic or pedestrians in the other direction needing it). One reason for delays and problems with confused motorists is refusal of the Ontario Government to use internationally adopted signaling practice, especially for LRT in reserved lanes but then Ontario has always had to re-invent everything, usually at great cost to the tax payers. As a reference I suggest the Transportation Cooperative Research Program Synthesis 79, “Light Rail Vehicle Collisions with Vehicles at Signalized Intersections”. If you are a member of CAA write to them to push for these changes as anything that reduces the confusion is good for transit riders and cars. The enemy of my enemy is my friend. Otherwise write to your mayor or councillor or MPP and pressure the Ontario Government to join the rest of the world. How many new streetcars are in service? When are they going to be deployed on Bathurst? Why was McCaul street stop removed on Queen? York and Simcoe stops should have been removed and not McCaul and now streetcars on Queen which say that they are going to McCaul won’t even take you there. Why was Carr St stop replaced with Eden Pl on Bathurst? Lastly, who makes these stupid decisions? The highest car in service is 4422, but we are missing 4401 and 4402, the prototypes. Therefore there are 21 cars in service (4400, 4403-4422). The next routes to get new cars are Harbourfront (which only has one or two, typically) and Cherry (which has only one). That will soak up deliveries planned for 2016. Next up is Bathurst. Several stops were removed by the TTC in the mistaken belief that this will speed up service. Some Councillors fought for and saved stops, others did not. McCaul is particularly amusing as it is a destination stop. Meanwhile, the stop at Simcoe should have been relocated to the intersection, but was not. You may be amused that some who leave comments here in a similar tone to yours railed (pardon the pun) against the time wasted at the “excessive” stops. I will be writing about the effect on King soon. I suspect the Carr Street stop was shifted to avoid having stopped streetcars across an intersection. There is a prominent sign “Do Not Block Intersection” beside the new carstop. I agree with Robert Wightman’s suggestion that transit traffic lights should have a format and colour meaningless to drivers. However, that seems to be a moot point unless streetcars get priority over left-turning road vehicles. Is the reason for left-turn priority the colour and symbols of the transit lights, or that the Transportation Department believes that moving left-turn vehicles is more important than moving streetcars? I have seen a few white lights attached to regular traffic lights to indicate when a transit vehicle may make an unopposed turn. So there seems to be a precedent for a special transit format. I suspect a letter campaign to local politicians about transit traffic lights would be difficult for your average politician to grasp. It may be better to pester Andy Byford and suggest that he push the issue. Steve: The signal aspects are dictated by the Highway Traffic Act and its regulations. This is also the reason there are pairs of every signal (regular traffic, left turns, transit signals) making streets like Spadina and Queens Quay look like Christmas trees. I asked about changes to bring the HTA better in line with international practice some time ago, and the response from the Ministry of Transportation was that they have no intention of modifying their standards. The main reason for having the left turn phase first on Spadina and St. Clair is the relative shortness of the lane. If it is put at the end of the signal then cars in the turn lane will back up into the left through lane and if the right through lane is blocked by right turning vehicles waiting for pedestrians then nothing gets through. The total cycle time is too short to give the trams their own separate through phase. On the suburban lines this should be possible but city traffic would not want to confuse motorists. There needs to be a lot of pressure brought to Minister Del Duca to make changes. This needs to come from a variety of sources which is why I suggest the CAA. We also need to get city hall, Waterloo region, Ottawa region and Peel, anyone who might have LRT put pressure on and then get the opposition parties involved where they can call the minister stupid and backwards. – green light for all traffic with left-turns yielding to conflicting traffic. – Give the green to all traffic. So my question is: Are left-turns given priority because of the colour and symbols of the transit lights, or because the Transportation Department believes that moving left-turn vehicles is more important than moving streetcars? Or is it a combination of both reasons? Rick Ducharme, when he was CGM of the TTC, wanted to get priority of streetcars over left-turns, but perhaps the idea was dropped after his departure. Steve: One streetcar per cycle could be a problem because it ties the streetcars to the signals with too little transit green time, definitely not a pro-transit move. The behaviour of intersections also depends on whether the stops are nearside or farside, and whether it’s a location with special work and a busy intersecting route. A sequence like transit green, left turns, general traffic green is particularly bad for farside stops because there is a greater chance of cars arriving at the intersection and being forced to wait for the brief transit green, only to stop again. Yet another variable to consider is the amount of green time, especially for wide crossings such as on Spadina, needed for pedestrians. One cannot simply change the signals for the streetcar’s favour on short notice. Nearside stops can also give problems, but more from the absence of any way to signal “I am ready to go now” between the streetcar and the traffic controller. I am sure that the technology to deal with this exists somewhere, but not in Toronto. Steve: The highest car in service is 4422, but we are missing 4401 and 4402, the prototypes. Therefore there are 21 cars in service (4400, 4403-4422). I rode 4422 on mid-day Friday, heading out from Union Station on the Spadina route. It was pretty packed. I was wondering about the high car number. I also noticed a couple of unpleasant things about the car. It was really filthy, apparently not cleaned in a while. However, what bothered me the most was that there are ivory white panels in front of the seats, and some goon or goons had deliberately smeared them with black shoeprints. Quite disgusting, and this is the newest car. Perhaps ivory white is a poor choice for interior panels at foot level? Steve: During the design stage, I sat on a committee that was more for show than substance to tweak the design of the new cars. The basic problem was that we came to the project when it was so far advanced, very little could be altered. One of our members, herself a professional interior designer, wanted the interior colour scheme to vary from light at the ceiling down to darker hues at floor level. This was rejected because they wanted a standard colour for all of the panels. Among the few things we did manage to get were: (a) a darker red than “CLRV red”, although what they used is still a bit lighter than what we asked for, and (b) a change in colour scheme for the “front” of the “city” cars so that they have a distinctive look compared to the “back” end. This will not apply to the Metrolinx cars which are double ended and have no “front” per se. Picky point: I believe you’re slightly mistaken, at least for Spadina. Left turns are allowed only at the beginning of the cycle; once the general green begins, the heads marked LEFT TURN SIGNAL turn and remain red. Since streetcars run straight ahead from left of the left-turn lane, allowing left turns while streetcars may proceed invites collisions from left-turning motorists, not because the motorists are stupid or careless (though many likely are) but because it would require a turning motorist to look in two nearly-opposite directions simultaneously: where a streetcar might come up from behind, and at the oppositing traffic lanes. This is, by the way, the same logic underlying the rarely-observed rule in the Highway Traffic Act requiring that a motorist merge to the rightmost lane before turning right, even when that is a bike lane. But that’s a different rant, and one not really appropriate here. In the sequence (1) transit green, (2) left turns, (3) general traffic green, I expected streetcars to cross in both steps 1 and 3 so that streetcars would have more than the few seconds of step 1. Could the time for step 1 be pulled from step 3 rather than from cross-traffic? The wide street problem pertains to pedestrian cross-traffic and generally the ROW crosses 4-lane streets (or even laneways along Queens Quay). For nearside stops, could the driver signal “I am ready to go now” via a transponder? Don’t all streetcars and buses have such a transponder? But from much earlier articles, I believe that you lamented the lack of streetcar priority on PROW routes. So, did you have a suggested solution, or is this a quixotic quest? I’m just trying to understand the problem. It’s disappointing that streetcars on a ROW seem to spend so much time at red lights. Steve: I don’t think that splitting the streetcar green is a good idea because inevitably a streetcar on its “advance” phase will be trying to get through at the same time as a left turning motorist jumps his own signal. What is needed is green time extension to ensure that on an approach to a farside stop, an approaching streetcar is not caught at the tail end of the green cycle. Yes, this poses problems at very wide cross streets because there are limits to how much time you can “borrow” from the next cross cycle. No, streetcars and buses do not have a transponder. Interesting discussion on signal priority. CLRV4037 pointed out that the signal at Dan Leckie employs the 1) (very brief) transit green 2) everyone else gets to go green methodology…and that streetcars almost always have to wait. I’ve noticed this as well, and it admittedly seems like a terrible design. I suspect left turns are cleared first not so much due to light colour confusion or their importance, but their movement constraints relative to everyone else – streetcars and normal green can cooperate fine, but left turns cannot. That being said, the signal could (should?) be moved to the end of the cycle…this would make them last priority and clear left turns at the end of a light (when they normally do), but it would be counter-intuitive as we expect “advanced” greens as drivers. I also agree with Robert Wightman that clearing the left hand lane (which itself is relatively short on streets like Spadina, St Clair, Queens Quay) can be very beneficial as left turners can otherwise block through traffic waiting to turn if they don’t all fit in their queue. That being said a discussion of *proper* light timing for transit priority is moot as most lights refuse to enforce it or even have the required hardware. It is not difficult, with the correct networking between signals and sensors in place for transit priority, to ensure that streetcars almost never stop if they’re in their own ROW. The key is knowing if a streetcar is stopping or not, and when it’s done if so (along with stop-by-stop average loading times by time of day). That way if a light is about to turn green for a light a streetcar is approaching with a left turn lane and the streetcar is passing through or has already finished loading, it can delay the left turn to the *end* of the signal, allowing the streetcar to pass through ASAP. Meanwhile if it is approaching to stop and load/unload, the signal can clear the left turn first, increasing the “post stop” green time for any other cars that might be closely following. The examples are many but without knowledge of where a streetcar is, if it’s stopping or not, and what traffic is like, it’s hard to do anything about it…nevermind getting consent from the traffic folks! Steve: If you think that’s bad, a proposal floating around would be to use vehicle GPS info combined with schedule data to decide whether a streetcar should get extra green time. This has two huge flaws, well three actually for downtown. First, there is a lag time between the point where a vehicle reports its location and a client system “sees” that. At the level of traffic signal timing this would be crucial. Second, we all know that schedules are meaningless on busy routes, and so the decision to give priority would be based on a false premise. Third, in many locations downtown there are buses and streetcars that become completely “lost” due to GPS signal reflections. They report amusing locations including the middle of Lake Ontario, but there are no transit priority signals there. If the vehicle location is incorrect, then it cannot drive a transit priority signal. My brother spent a 4-month co-op work term in Engineering studies in university in the late 1980’s working for the City of Ottawa and one of his projects was revising traffic signals at a downtown intersection to include an advanced green arrow phase for left-turning vehicles on one of the streets. He spent days sitting at the intersection watching how many cars got stuck not being able to make the left turn and how long it actually took those cars to pass through the intersection. This time period changed based on time of day (a.m. & p.m. rush hours were worse) and these data helped the traffic planners determine signal length. Now this was for *cars/trucks* and not transit vehicles, but it showed me how complex the systems are that control traffic flow in a large city and also how those systems can be set up to help improve the traffic flow by looking at specific needs and adjusting the equipment in use to maximize the benefits desired. Switching to transit now, Toronto, as a city, seems – actively – not to care at all for its “taxpayer” citizens who also happen to be transit users: that somehow their time stuck behind vehicles trying to make illegal left turns or blocking intersections because they couldn’t make it through on their traffic signal phase is less valuable. I came across a following document from 2006 – 10 years ago, note – called “A Sophisticated Transit Signal Priority System – How it Works” prepared by Ron Stewart and Mike Corby, two Professional Engineers employed by a downtown Toronto engineering firm. It is, as the cover sheet describes its 17 pages, a “Paper prepared for presentation at the Strategies for Transit Priority System Implementation of the 2006 Annual Conference of the Transportation Association of Canada.” It discusses the basic components of transit signal priority systems, laying out options that can be incorporated into local traffic management systems and how they may benefit transit flow. Note that “Toronto” is not included in this list of areas which incorporate implementation of TSP systems. So my questions are: Are these Toronto Professional Engineers unaware of the beneficial work for transit priority taking place in their own city? Or, perhaps, there was nothing of interest to look at in the local context because nothing is being done. In fact, was anyone from the City Traffic Department attending this conference in 2006? And 10 years later, has there been any movement towards implementing any kind of TSP system into the existing traffic control systems? (This question is, in my opinion, rhetorical, especially when we look at what’s been happening on King St. and what’s now taking place on Queen’s Quay). I can appreciate that the conflicting needs of personal/private vehicular traffic, transit vehicles and pedestrians must be examined within specific contexts and at different street intersections and the “solutions” shown within the conference document aren’t one-size-fits-all, snap-my-fingers-and-voila! But these systems *do* exist in the real world and it should be straightforward to perform analysis of transit flow and begin implementing changes to the systems in short order. Heck, Steve, you’re able to review bus and streetcar travel records and produce *very detailed* reports along with analysis – and you’re not getting paid by the City or the TTC! Seems to me that inertia of City Traffic staff – buoyed by disinterest or even active, outright hostility by Councillors (a holdover of the last Mayor’s disdain for transit in general? – except for those shiny subways!) – is a big culprit of even starting the review process. Why? Do all these City employees drive to work?!? As the song goes, “You Can’t Have One Without the Other….” I keep hoping (har, har) that the City and TTC get coordinated sooner rather than later, especially since the tools are readily available, the coordination work isn’t rocket science and the payoff would be visibly positive for transit users. Just gotta have the desire to actually promote, launch and maintain the program…. Steve: A few points here. I have done some work for TTC and City Transportation based on the type of analysis you see on this site. So far, this has been limited to reviews of the downtown sections of the main east-west streetcar lines with a view to supporting changes in parking and turning regulations at the shoulders of the peak periods. Some of this has already been implemented and there is more to come. I have also provided some material pro bono. The City already has a program underway to study and improve downtown traffic flow, and they intend to look at some of the major suburban arterial streets as well. Some of the current work is looking in more detail at transit vehicle behaviour to get info on just what holds up streetcars. The vehicle tracking data can show where and how much transit vehicles are slowed, but not why. This can include factors such as loading delays, general congestion, lack of capacity for turns causing queued autos to block flow, among other factors. It will not come as any surprise that passenger loading and unloading consumes a considerable amount of time and, of course, causes transit vehicles to have a fundamentally different behaviour at intersections. As for transit priority, it does exist at many locations, although there are limitations. Some are related to physical constraints such as the need for green time on crossing streets and for pedestrians, some to philosophical isues about “who gets priority”, and some to technical limitations of the implementation. One challenge at intersections of very busy routes is that there will almost always be a transit vehicle present in at least one direction. This can be complicated by a mixture of nearside and farside stop placement such as exists on Spadina at several cross-streets. At other locations, the general traffic flow may take precedence over transit priority such as through the area roughly between Church and University where giving more green time to transit generally would mean favouring east-west movements and could cause backups on the north-south streets. Another common finding when I have reviewed transit routes is that there can be huge differences from one day to the next due to the presence or absence of short-term loss of road capacity. A street might operate at a tolerable level of congestion, only to be thrown into disarray by a curb lane blockage for utility construction, or by special events that add road demand or remove road capacity. There is also woefully inadequate (usually completely missing) provision for “priority” on well-used diversionary routes which causes operations such as the 501 Queen via King diversion now in effect to take even longer than it might. There are also priority mechanisms that simply don’t work because TTC equipment needed to trigger them (the electric switch controllers at intersections) is offline, not functioning properly, or not connected to the signals to support commonly-used turns on diversion routes. There are debates about how green time extension should work and how generous it should be. This is a particular challenge on the many streets with nearside stops where a transit vehicle might actually sit blocking traffic in one direction while the signal gives it “priority” for a movement that will not happen within the current cycle. The length of the green extension has been reduced since the original implementation to avoid loss of too much intersection capacity. There has been talk of a schedule-based priority system, but as we all know, transit vehicles do not run “on schedule” a great deal of the time. When even the TTC cannot decide what its internal scheme for measuring service quality might be (currently they are only looking at performance stats at terminals, and these are quite generous), one would be hard-pressed to decide if a schedule based system is a good idea. It would, of course, do nothing for vehicles that are not on their assigned routes due to diversions, and this is the very time when priority is most likely needed. The original transit priority implementation used a fairly simple software model in the traffic controllers that was limited in what it could provide. Newer controllers (such as are now in place on Queens Quay) can do more. I do not know the specs in detail to provide a comparison between the old and new machines, let alone a discussion of whether the implementation of their capabilities is appropriate. What I can say from simple observation over the years is that there are different schemes used at different locations around the city. It’s not a “one size fits all” situation. Finally, the bigger challenge lies in the question of “whose road is it anyway” and the political task of taking away functionality — road lanes and/or parking repurposed for cycling or transit. In some ways this can be very low tech — changing bylaws to restrict how the road is used, erecting bollards to segment the pavement by type of use. Transit priority has a role to play too, and the debate remains about just how much “priority” should actually be given to TTC vehicles. The problems with “transit priority” are apparent west of Roncesvalles, where on The Queensway ROW Streetcars 7 km/h through intersection has latterly been replaced by Streetcars 10 km/h through intersection. This is especially frustrating at Colborne Lodge Drive, where 95% of the time streetcars don’t have to stop. Considering Parkside Drive doesn’t see that much use, and the long greens for The Queensway, streetcars could run at good speed between Glendale and Ellis Park. What happens, though, is rule-following operators slow waaaaay down….and the signal turns red. So the streetcar and its passengers sit through the cross-street signal, followed by left-turns from The Queensway. The traffic signal placed at the exit of the Humber loop underpass to Lake Shore is likewise troublesome. There is no need for it eastbound (no left-turning automobile traffic to worry about) and it could perfectly well be a regular signal as seen, e.g. where the Carlton car turns from Dundas to Howard Park, or from Parliament to Gerrard. But no, there’s a five-second transit phase, which may or may not trigger. Sometimes the streetcar sits for 45 seconds facing a pointless red signal. However, over a year and a half since the signal de-prioritized the streetcar, the TTC has done nothing about this tedious, unnecessary delay. The funny thing is that eastbound on The Queensway at Glendale, the automotive left-turn lane is placed right on top of the streetcar tracks. In other words, the ROW ends, and cars can cut left onto the tracks to make a left turn. What’s funny is, there’s no 10 km/h through intersecton (that I’ve noticed, anyway), and from my experience riding the streetcar, the arrangement works pretty smoothly. There isn’t even that much of a delay for the streetcar, which usually gets to the far-side Glendale stop in short order. I am really disappointed in the “traffic engineers” who have no problems specifying and installing massively complex and overbuilt signals, at great capital and maintenance expense, without actually watching the intersection and figuring out what the signals ought to be doing in the first place. It’s thoughtless, desk engineering. Here are the specs for signal systems and mandated by provincial code, here’s a system that ticks all the boxes, install it, go for coffee. No need to verify if it’s the right solution, or even think about what solution is the best. Meets regs: done! I remember back when I was riding the Finch East bus. Finch had lanes closed between Yonge and Bayview for sewer installation, so that part was a mess. Bayview always got a long green: the pedestrian countdown would go to zero, but the light would stay green for another 30 seconds at least. It was as if a transit priority signal for Bayview was activated. (Think about the relative frequency of buses on Bayview versus Finch East.) The odd vehicle would travel through the intersection on Bayview; all this while, traffic would be backing up on Finch for up to a kilometre. I phoned this in to 311. “Oh, we check the signals regularly!” they assured us. And nothing changed.